Home » Treadmill » What is an Anti-Gravity Treadmill? The words “anti-gravity treadmill” are a strange combination. They might conjure images of the International Space Station (which has a treadmill, so take your workout clothes if you’re going). Maybe they make you think of some kind of space-age bubble. You’ll actually find these devices right here on Earth, but if you thought of either idea above, you’re not entirely wrong. An anti-gravity treadmills look pretty crazy, like an enormous balloon space suit for your lower body. But, they are quite useful for athletes and others dealing with injuries. Let’s dive into what exactly an anti-gravity treadmill is, because it’s certainly a lot different than our normal conception of treadmills. 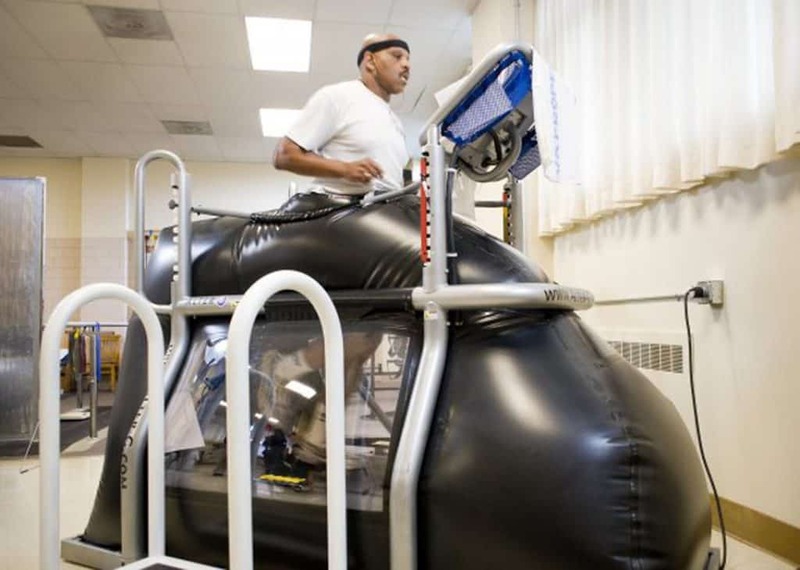 Robert Whalen, a biomechanics researcher at NASA Ames Research Center, invented the anti-gravity treadmill in the 1990s. Whalen wanted to address the difficulties discovered with a previous treadmill on the International Space Station. That machine used a bungee system to anchor the astronaut to the treadmill. This was not successful for two reasons. It doesn’t really replicate how people run on Earth, and it was pretty uncomfortable to run in. Whalen’s design enclosed the treadmill, and placed the lower body of the astronaut—the people the treadmill was originally designed for—in an airtight chamber. Air pressure inside the chamber is lowered, pushing the astronaut down and simulating gravity. With the old ISS treadmill, astronauts could only run at about 60 percent of their weight on earth, whereas with an anti-gravity treadmill, astronauts can exercise at their normal Earth weight in space. In 2005, Whalen licensed this patented design to Menlo Park, California-based company AlterG. Anti-gravity treadmills use a difference in air pressure to offset your weight. The lower portion is inflated to an air pressure higher than the surrounding atmosphere. This difference creates an adjustable amount of buoyancy, taking weight off your lower body. It’s like standing in an inflatable raft while someone else blows it up. You don’t feel the pressure because it doesn’t take much to lighten you up, making it easy to add extra miles without worrying about injuring yourself. To use one, you zip yourself into an airtight bag that encompasses your lower body and the treadmill deck. Next, you choose a running speed and decide what percentage of your weight you want to remove. After you’re sealed in, the system will calibrate to adjust to you and the input it received. Given that this machine is already considerably geekier than your standard treadmill, you can expect a very in-depth console. You can see cadence, strike force, stance time, and stride-length symmetry among other data relating to the anti-gravity effects. With anti-gravity treadmills, physical therapists can successfully treat injuries and conditions like shin splints, total knee or hip arthroplasty, foot and lower back pain, and even TBIs. If individuals use an anti-gravity treadmill to return to activity as soon as possible while injured, they will experience less muscle atrophy and decreased swelling. Professional athletes use anti-gravity treadmills frequently to recover from injuries. Even if you aren’t injured right now, an anti-gravity treadmill can allow you to go farther with less impact, preventing future injuries. You can try running between 85 to 95 percent of your normal weight, and you’ll run with a higher turnover. Runner’s World recommends a tempo workout of 5 x 5:00 at half-marathon pace with 1:00 of easy running to recover. A low-impact workout like this can help you stay healthy and uninjured as you increase your mileage. In sum, there’s a lot that an anti-gravity treadmill can do. It can assist with and optimize rehabilitation, as well as improve recovery times. Normal walking and running mechanics can be restored while tissue heals. NASA has great things to say about anti-gravity treadmills, noting that they can be used for professional and college athletes, injured military members, and seniors. A variety of patients suffering from brain injuries, neurological disorders, and athletic injuries have used them successfully. Those who live with arthritis, obesity, and other joint-stressing conditions have also found anti-gravity treadmills a good way to exercise. Even if you don’t fit into these categories, an anti-gravity treadmill can help you. Mobility, strength, and natural movement can all be improved without undue stress on your body. In fact, a 2012 Stanford study in Medicine & Science in Sports & Exercise even found that runners were able to reach the VO2 max and max heart rate with an anti-gravity treadmill. You’re able to run faster, with a workout that simulates the biomechanics and the aerobic demands of normal running. 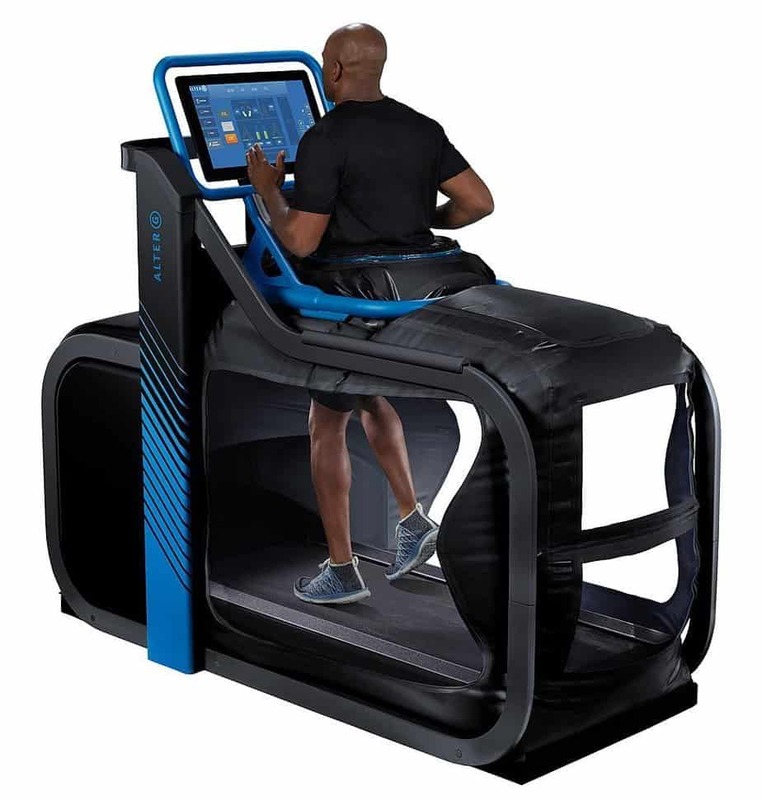 If you have injuries, want to see if an anti-gravity treadmill can make you a stronger runner, or just want to run in a bubble, you might want to consider trying out an anti-gravity treadmill. If you enter your zip code on AlterG, it will show you the nearest locations to try out an anti-gravity treadmill. Then you can see for yourself if they’re worth all the hype!